Mixed Chinese Gongbi and Xieyi is a traditional Chinese painting that has combined the two different and opposite painting techniques together, to create a new painting style. 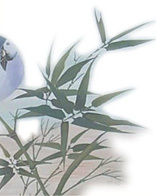 Sometimes, people paints the main part with Chinese Gongbi style, uses the lines to express it in the painting. It can be a person, a thing, an animal or a bird, rely on what you want to express mainly. Meanwhile, it uses Chinese Xieyi or Mogu style to paint the background or the objective view. But this is not absolute. Usually, as long as there are the two different styles in one painting, we call it a Mixed Chinese Gongbi and Xieyi painting. Therefore, Mixed Chinese Gongbi and Xieyi Painting has some realistic part characterized by fine brushwork, delicate strokes and pay attention to the detail part, on many occasions, this part is the focal point of the painting; also it has some freehand drawing part, to make the main part stand out by contrast. Usually, in a mixed Chinese Gongbi and Xieyi Painting, the Gongbi part is not very strict as same as a Chinese Gongbi Painting, it can be a little more unhurried and relaxed. I have learned to paint some Mixed Chinese Gongbi and Xieyi Paintings as my assignments in Chinese National Academy of Arts. Now I show some of them for you and hope they can help you to have a basic feeling about Mixed Chinese Gongbi and Xieyi Painting. This is my 56th Chinese Mogu Painting and my 966th painting since 2003. This is my 44th Chinese Mogu Painting and my 947th painting since 2003.